The D1000 and D2000 Series digital transmitters are a complete family of easy to use interface modules for personal computers and other processor based equipment with standard serial I/O ports. The modules convert analog input signals to engineering units and transmit, in ASCII format, to any host computer with a standard RS-232C or RS-485 port. This modular design enables anyone familiar with a personal computer to construct a flexible and cost effective data acquisition system. 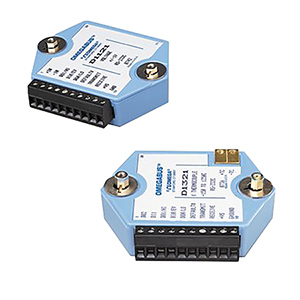 These modules can measure temperature, pressure, flow, voltages, currents and various types of digital signals. The D1000 series provide direct interface to a wide variety of sensors and perform all signal conditioning, scaling, linearization and conversion to engineering units. Each module also provides digital I/O lines for controlling devices through solid state relays or TTL signals. These digital I/O lines along with integral limit setting capability provide alarm and control outputs. With the exception of the D1400 RTD and D1500 bridge modules, every D1000 module contains an on-board event counter. The event counter will count up to ten million transitions on the digital input line. All user selectable options (address, baud rate, alarms, etc.) are done through the communications port and stored in nonvolatile memory thereby eliminating switches or external adjustments of any kind. The D2000 series of user programmable data acquisition and control modules allow direct interface of non-linear analog sensors to computers with serial I/O ports. Use of these modules enables downloading up to 23 breakpoints through the communications port. With these breakpoints the user can program a module to virtually any transfer function. A utility software package is available at no additional charge for the D1000 and D2000 family of products. This software provides program examples and a simple data logging program. The software may be downloaded from this web site from the "Software" link in the "Related Links" section at the bottom of this page. Unregulated Power Supplies, 16 to 23 Vdc, 300 mA max . Click here for details. RS232 to RS485 converter. Also provides 24V at 1amp to power the modules. Click here for details.